In the comments to my post on the extraordinarily weak 2nd qtr 2011 GDP numbers a reader asks for my thoughts about debt-to-GDP ratio and “how can we afford more stimulus”? Since my response will be a little long and others might be interested, I’ll post it here. Government spending now is somewhere around 28% of GDP, well above the 60 year average of 18.6% or so. Spending as a % of GDP is indeed up, but it’s not primarily as a result of discretionary spending going up. In other words, the so-called Stimulus spending bill didn’t do the damage. The ratio is up in large part because the denominator (GDP) shrunk. We lost a huge chunk of GDP. That has a double effect on the ratio. When the economy goes into recession and doesn’t recover it reduces the denominator by a big chunk. But a recession also automatically increases government spending through automatic stabilizers. Spending on unemployment compensation, welfare, Medicaid, SS disability claims, etc. automatically increases, thus increasing the numerator as well. Krugman shows this graph from the St.Louis Fed using non-partisan Congressional Budget Office data that compares the changes in spending to changes in the potential GDP over 60+ years. 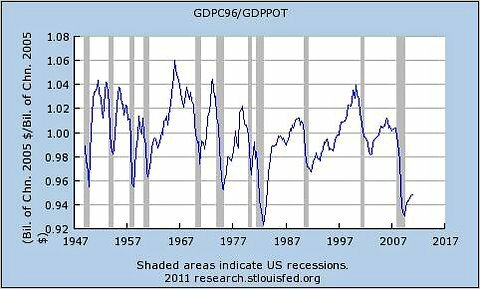 Potential GDP is the GDP that would be produced if we were at full employment. It indicates our capacity to produce if we choose to put all our resources (labor) to work. Any value that’s above 1.0 indicates that spending is rising faster than potential GDP. A value less than 1.0 indicates that spending is might be increasing in total dollars, but it’s increasing less than what the potential GDP is. When the value is less than 1.0 it means that government spending is having a contractionary effect on the economy. As you can see, the issue in the last few years is that despite the increase in dollars of spending, it’s been peanuts compared to the damage done by the banks’ financial crisis and the ensuing recession with high unemployment. This part of the reason why I’ve (and a lot of others) have said the stimulus program was too little and too short. Government deficit spending last year was about 10.9% of GDP, way over the sustainable comfort level of 2.6%. There’s two issues here. First, There’s nothing that says 2.6% deficit as % of actual GDP is “sustainable” and greater than that isn’t. “Sustainable” in the sense that we can operate at that level indefinitely might be less than 2.6% or it might be greater than 2.6%. For private sector entities (you,me, households, corporations, state governments) there’s a real meaning to “sustainable”. But that’s because ultimately our spending ability is limited by the combination of our earning and borrowing ability. Borrow too much and eventually lenders say “I don’t think you can pay it back, so pay higher interest rates, the debt begins to spiral up, etc.”. But for a sovereign national government that creates it’s own currency, borrows using bonds denominated in that currency, and doesn’t strap itself to some fixed exchange rate system (like gold standard), there is no financial limit to the borrowing. All of the nations that are having debt crises now (or in the past) have either strapped themselves to somebody else’s currency (Greece & Ireland with the Euro, Argentina in 2000 with the dollar) OR they borrowed their money in somebody else’s currency (less developed countries borrow in $ not their own currencies) OR they have a fixed exchange rate (under the old gold standard 80 years ago). What matters for “sustainability” is the ability of the economy to produce. Does it have the real resources to produce what the government is willing to spend on? In this sense we see that even a 1-2% deficit-to-GDP ratio might be too high if we were at full employment and had no excess resources. But the U.S. today has more than 10% of it’s labor force (even more since many would be workers aren’t looking) sitting on it’s hands doing nothing. Another way of looking at the sustainability and desirability of deficit spending is to compare the interest rate the government has to pay to borrow now vs. the long-term growth rate of the economy. If interest rates on government bonds were in the 6-8% range or higher (like in Greece and Italy), then large deficit spending might not be sustainable. But the U.S. is borrowing at near record low interest rates, less than 1% for a year. Borrow at low rates, spend to invest in those things that grow your economy and get paid back later in larger GDP. That brings me to my second point on “sustainability”. The budget, government spending, is dynamic. What GDP is the greatest determinant of what the deficit actually ends up being. The budget discussions in Washington about 10 year projections are usually static projections. They assume they can change the spending amounts while keeping the projected path of GDP the same. Doesn’t work that way. Running a large deficit relative to GDP, the kind of stimulus I think we need, will raise the deficit-to-GDP number immediately, but the ratio will then automatically decline. Again it’s the automatic stabilizers mentioned earlier. As people go back to work and unemployment declines, the GDP rises faster. Those people also pay taxes, so government revenues increase. Spending in the form of unemployment comp, welfare, disability payments, Medicaid, etc all drop as people go back to work. The deficit automatically shrinks relative to GDP. This was how Clinton managed to produce a narrow government surplus at the end of this second term. He eliminated the deficit completely. It wasn’t by cutting spending. It was because the economy grew enough to reach full employment. Government debt is just under 100% of GDP, the highest level in our economy that we’ve seen since WWII where it briefly spiked well above that. Yeah, so what? Japan’s debt is around 200% of GDP and has been for over a decade. Government debt is not like private debt. It doesn’t have to be paid off. Government bonds are really just like government issued paper currency that pays interest. This is why banks and investors love government bonds. It’s a way to hold large amounts of cash and still earn interest. A growing economy also needs a growing money supply and a growing supply of government bonds. In the early part of this past decade (I forget the year), Australia was running a surplus for a few years. It was paying down it’s national debt. The bankers went to the Australian Treasury and the Australian central bank and asked the government to borrow and issue bonds anyway because they needed a larger volume of bonds in existence in order to run the banks. Through “Intergovernmental Holdings” the U.S. government owns about 1/3rd of its own debt. Yes. $4.6 trillion, approximately 1/3, of the $14.3 trillion total US government debt is “owned” by various other parts of the government. The biggest chunk is the Social Security trust fund, $2.7 trillion. The rest is in various other government “trust funds” such as Railroad employees retirement fund, government employees pension plans, highway building trust fund (paid by gas taxes), etc. These funds reflect special taxes or fees that have been collected that are by law dedicated to a particular purpose, but the government hasn’t spent the money on that purpose yet. The accumulation of money in these funds (think of them as pre-payments of special taxes) must by law then be “invested” in the safest interest bearing assets available, which happen to be U.S. government bonds. Let’s take a brief look at one of these funds: the Social Security trust fund. The way SS works, dedicated SS payroll taxes are collected each month to pay for this month’s benefits. (FICA taxes). Obviously we want benefits to be relatively constant month-by-month. Grandma wants to know just how much her check will be next month. But the payroll taxes collected each month vary greatly. So, by the original law, SS Admin was supposed to make sure it always had enough liquid cash on hand to pay 1 year’s anticipated benefits. This is the trust fund. In the 1980’s the trust fund was too low – nearly depleted because benefits had been increased. So payroll taxes were increased. When the trust fund had fully recovered (circa 1991), the decision was made to continue to collect extra payroll taxes from workers in the 1990’s and early 2000’s in anticipation of the baby boom. The current $2.7 trillion trust fund represents way more than the law said was necessary. It represents the baby boomers having already pre-paid their own retirements. These intra-governmental bonds cannot be traded on the public market, but they are regular debt obligations of the Treasury nonetheless. To not pay these bonds is to renege on previous promises that people have relied upon. It also might not be legal, although that is outside my experise. In addition to the $4.3 intragovernmental holdings, there’s $1.6 trillion in government bonds held by The Federal Reserve. These are ordinary bonds that The Fed bought from banks (that’s where banks get reserves). Any interest paid on these bonds goes to The Fed who then sends it back to the Treasury as Fed profits. This amount could easily be reduced by maybe 1/2 without consequences. Given these constraints, where can we get the money to fund spending programs like the “stimulus” to create jobs and recover the economy? As I attempted to describe above, it’s a fallacy to think of the government as having a financial constraint on it’s resources. Government (again, a sovereign, fiat money, floating exchange rate, government that borrows in it’s own currency) faces no financial constraint. Government is not like a household no matter how often misguided politicians say it. You, I, households, firms, corporations, and state and local governments must obtain cash from either income or borrowing before we spend it. Government does not face that constraint. Government defines and creates the reserves that can become our spending money. It has a monopoly on the creation of money. And money today can be created as fast a somebody at the central bank can type (although we may not want to create it that fast). Let’s consider what actually happens when the government spends. The Treasury writes a check and sends it to a contractor, or SS beneficiary, or someone. That check is drawn on an account at The Fed Reserve bank. Let’s suppose you get the check. You got income from the government. You take the check to your bank, let’s say it’s Chase. You deposit it in your checking account. You go out and spend the money by using your debit card to buy dinner, thereby helping to create a job and employ a waiter and kitchen staff. But what happens at the bank? Chase takes your check and sends it to The Federal Reserve. The Federal Reserve takes the government check and credits Chase’s account at The Fed. This creates bank reserves. The Federal Reserve has no limit on how much bank reserves they can create. They can create all they want. In the barbarous old days of the gold standard (before 1971), The Fed would have had to make sure it had enough gold on hand before issuing any reserves. No such limit now. So why doesn’t the government just spend endlessly with no limit? Well, there’s no financial constraint on the government spending, but there’s a real resource constraint. When the government attempts to increase deficit spending it is in effect placing orders for work to be done, things to be produced, and people to be employed (you do the same thing when you spend). As long as there are unemployed resources to be put to work, the deficit spending is OK. It stimulates more activity. But if there are no idle resources then increased deficit spending will produce inflation because the government would be bidding against everybody else for resources. At nearly 10% unemployment we have plenty of idle resources and that’s why there’s no threat of inflation despite the worries of those who don’t understand the gold standard ended 40 years ago. There’s one other aspect of deficit spending that’s important. This is not the result of theory, but rather is pure accounting. I’ll just give a very brief mention of it here, but there’s a full tutorial here by Randall Wray. A one page view of this idea is here. Basically, government deficits are the mirror of the private sector. There’s three “balances” that must add up to zero. There’s the government spending vs. taxes balance, called the budget deficit. There’s the question of whether the private sector (all households and firms together) are accumulating financial assets. This is called “net private financial wealth”. It’s the difference between what our private incomes each year and our private spending. If we spend less than our income, then we are accumulating net financial assets, or in plain language, we’re putting money away in our bank accounts and investment accounts. There’s a third balance which is the external capital account balance. Basically it’s like the private net financial asset accumulation except it records how much foreigners are accumulating U.S. denominated financial assets. If imports are greater than exports (trade deficit), then foreigners are collecting U.S. financial assets, typically government bonds. Now there’s no way the private sector can create net any new financial assets. If I loan money to you, yes, I create a financial asset on my books. But you’ve created an exactly offsetting private debt on your books. In aggregate, the private sector cannot create new financial assets. That’s because financial assets are things like money, currency, and bonds. And they can only be created by government. They can also be gotten from foreigners by selling more exports than imports, but that ain’t gonna happen anytime soon. By accounting, these three balances must equal zero. This means that when the government runs a deficit it creates net financial assets that the private sector can accumulate. If the government creates a surplus. In simple language, this means that, assuming we run a trade deficit, that a government deficit means the private sector can accumulate financial assets. If the government runs a surplus, though, it means the private sector must go deeper into debt itself. See the answer to question 1 here for another explanation. There’s a dramatic historical graph that beautifully illustrates this relationship over the last 60 years. Unfortunately, I can’t put my hands (mouse, really) on it right now. When I find it again I’ll update. The point is that government surpluses, the kind that the Tea Party and many Republicans claim they want as being responsible, can only happen if the private sector as a whole goes deeper into debt. It’s private debt that got us into the Great Recession/Financial Crisis, not public debt. In fact, the Clinton surpluses were a small part of it because to create those Clinton surpluses the private sector had to go deeper into private debt – which we did. It was called mortgages, corporate debt, credit cards, student loans, etc. A long response, but I hope it was worth it and helps. Thanks very much for for your very detailed response. Its a lot to absorb. I will study it further and comment and perhaps ask more questions. You’re welcome. Yeah, it’s a lot at once. When I was done, though, I realized it’ll also be useful in my classes. Hello, I appreciate your article, however, I still wondering what is the meaning of the National Debt over GDP ratio? My numbers based on the US debt clock http://www.usdebtclock.org/index.html show me that this ratio currently around 98%. Could you briefly explain what is the meaning behind this number? Truth spoken by Mark. The author above ignores the private debt problem, ignores the result of continued borrowing (interest rates will rise, just see who wants Greek bonds now), and ignores the fact that debt is growing continually faster than GDP (they aren’t growing at equal rates).